AFC - 02/05/11 Fur is Stone Age Fashion! 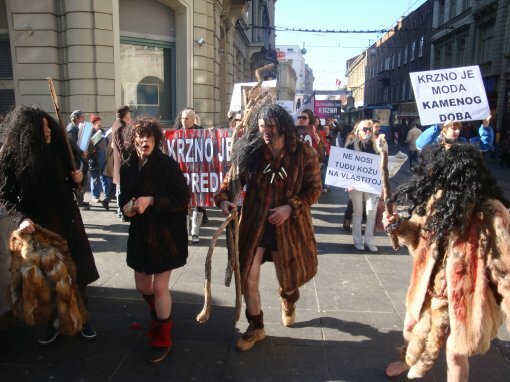 During the Stone Age, humans wore fur out of necessity, not as a means of expressing their taste in fashion. Despite that, human greed for profit has resulted in the enslavement of numerous wild animal species on so-called fur farms, where they live in miserable conditions and meet their death by being gassed, electrocuted, strangled, poisoned, by having their necks broken or red hot iron bars stuck up their anuses. Over 75 million chinchillas, foxes, beavers, dogs, cats, ferrets, rabbits, squirrels, and other types of animals are tortured and killed every year for this sort of false glamour. Civilized people cannot understand how it is possible that the fur industry is allowed to gain its bloody profit by destroying numerous animal lives in a most brutal way, simply because these animals have been born in furry bodies. It is comparable to the shocking fact that in the past people of other skin colours or race were humiliated, tortured and killed simply because they were physically different. Wearing animal fur brings the picture of cavemen around the fire into our minds. It is certainly incompatible with the glamour and fashion of our modern times. Animals do not wear fur as a fashion accessory; it is a part of their bodies and their lives. This simple fact has been acknowledged by a number of prominent Croatian and international fashion designers and stylists, who resolutely reject using animal fur in their collections, which is why the ratio between using fake and real fur in fashion industry is now approximately 10:1, which proves the increasing degree of awareness in both fashion designers and the consumers. Animal Friends invites everyone to join the protest in Zagreb city centre, which will take place on Saturday, February 5, 2011. The protest march will start at 11:00 A.M. from Trg kralja Tomislava and take the following route: Trg Nikole Subica Zrinskog (Zrinjevac), Teslina, Masarykova, Frankopanska, and Ilica, ending at Trg bana Jelacica – where at 12:30 P.M. an impressive performance will take place. 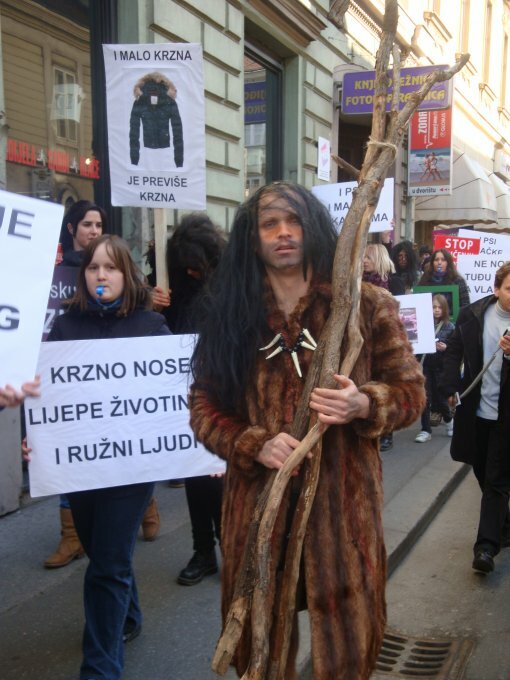 Activists from the neighboring countries will be joining the protest and Croatian celebrities Luka Nizetic, Lea Dekleva, Fani Stipkovic, and others have announced their support of the protest by joining us. 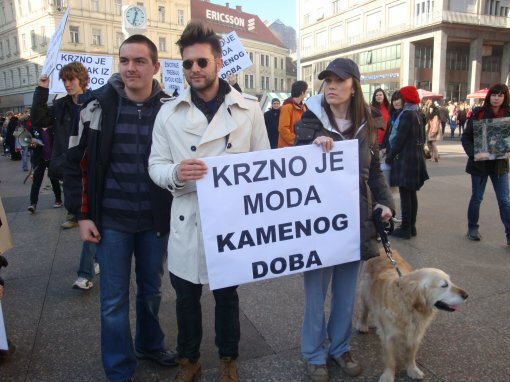 In Croatia, raising animals for fur was banned in 2007, with a ten-year transition period. 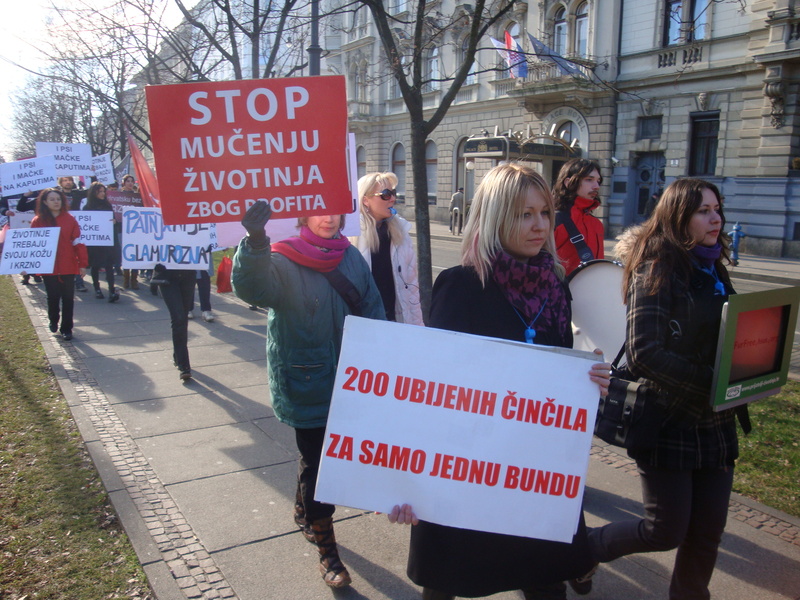 The enactment of this ban was supported by the majority of Croatian citizens. Animal Friends now invites everyone – general consumers, celebrities, designers, and fashion agencies – to join the campaign "For Croatia without Fur," which was launched earlier this year with the provoking billboard designed by Bruketa&Zinic studio: "Not All Have Evolved." 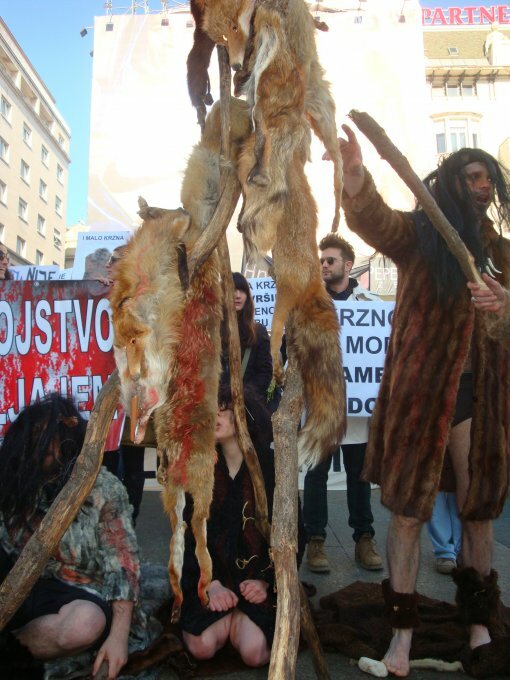 We invite you to raise your voice and condemn the killing animals for fur. Today, thanks to advanced technologies high-quality fake fur is not essentially different from the real one anymore, not mentioning the huge choice of natural and artificial ethical and ecologically more acceptable fabrics, killing animals for garments and luxury is completely unacceptable. Humans no longer live in nomadic tribes and their survival does not depend on animals they catch and kill. That is why it is high time that we should completely ban the ethically and ecologically unacceptable practice of wearing the skin and fur of other living beings. For additional information and suggestions on how to become active in order to achieve positive change in our relationship towards other living beings, please visit www.prijatelji-zivotinja.hr. To see a photo gallery from the demo please click here.